Overcomers In Christ. 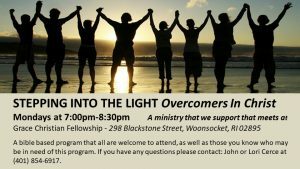 A Bible-based 12 Step Recovery Program that Grace Christian Fellowship Supports. We are pleased to announce that our Lord & Saviour Jesus Christ has blessed our brother & Deacon John Cerce and his wife Lori with a growing ministry that is held at Grace Christian Fellowship. ALL from Grace Christian Fellowship are welcome to attend as well as those you know who may be in need of this program. Further questions, contact John or Lori Cerce at (401) 854-6917. This ministry meets every Monday night.